Annenberg Public Policy Center (APPC) director Kathleen Hall Jamieson moderated panels on civics and fake news at the Ninth Circuit Judicial Conference in San Francisco, a week after kicking off a seminar series in Steamboat Springs, Colo., with a talk on fake news. The July 20 panel on fake news, “Lies, Damn Lies, and the News? Fake News: What It Is, What It Means, and Why It Matters,” was introduced by Hon. John B. Owens, Circuit Judge, U.S. Court of Appeals for the Ninth Circuit, and featured Paul Singh Grewal, deputy general counsel for Facebook; commentator and radio host Hugh Hewitt; Slate senior editor Dahlia Lithwick; and Susan Weiner, general counsel for NBCUniversal news group. Kathleen Hall Jamieson (left) at the Ninth Circuit Judicial Conference in San Francisco, on Monday, July 17, 2017. The Hon. Neil Gorsuch, Associate Justice of the Supreme Court, is third from the left. 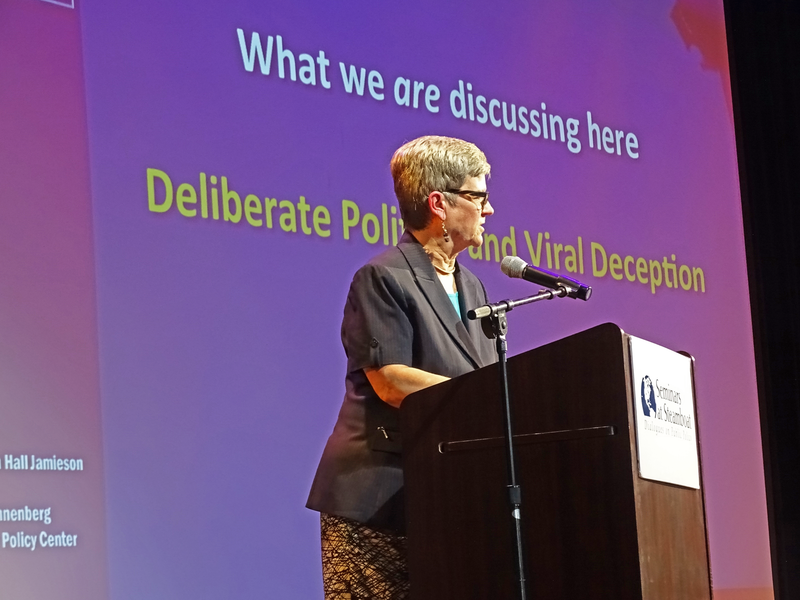 Jamieson discussed the dangers of fake news in the political world and beyond, as well as her proposed alternate term: “viral deception,” or V.D. As reported by Courthouse News Service, she explained that with fake news, just like with venereal disease, “we need to be clear that you do not want to catch it, you do not want to transmit it and we’d like to say it’s been eradicated.” The panel discussed the implications of fake news on electoral politics, as well as in the business sector and in national security. In an exchange reported by the Courthouse News Service, Jamieson noted that a 2016 APPC survey found that only a quarter of the American public can name all three branches of government – legislative, executive and judicial. Gorsuch and others said that a lack of civics knowledge should serve as a reminder that democracy relies on an informed citizenry. “It’s a really healthy reminder that self-government is not self-sustaining or self-perpetuating, but depends on all of us playing a role to keep it,” Gorsuch said, according to the news service. Jamieson asked Gorsuch what part of the court system is poorly understood. He said the extent to which judges find consensus is vastly undercovered by the press and underappreciated by the public. He noted that the Supreme Court, with nine justices nominated by six different presidents, manages to make unanimous decisions more than 40 percent of the time, according to the news service. Kathleen Hall Jamieson presents at Seminars at Steamboat. Credit: Jennie Lay. The talk also touched on the prevalence of viral deception in social media and online news, and how companies like Facebook and Google are working to fight it, with the help of FactCheck.org, an APPC project co-founded by Jamieson. For more details, click here for coverage by Steamboat Today.